Of great interest to geologists is where seamounts occur on the ocean floor. Why does magma break the earth’s crust at these locations and not others? Active plate boundaries, such as mid-ocean ridges (e.g. Iceland) and subduction zones (e.g. Japan) are clear sources of volcanism, but what processes cause magma to flow out of the earth in the middle of a plate? Understanding this intra-plate volcanism is one of the main motivations for this cruise. The most commonly cited explanation for intra-plate volcanism is mantle plumes, also known as hotspots. A mantle plume is a column of material that moves upwards from great depths because it is hotter and thus less dense than the surrounding rock. Although the upper part of the earth (the crust) is solid on human time scales, the deeper parts of the earth are actually ductile and move very slowly over thousands of years. 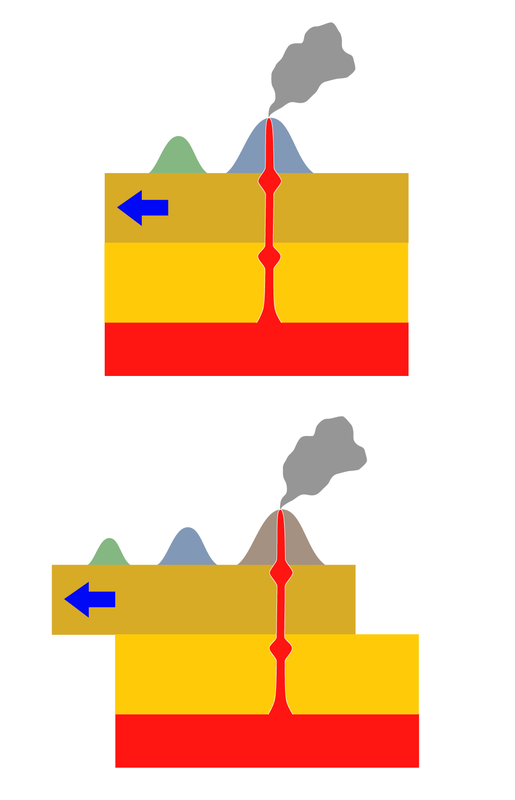 This is how ‘solid’ rock from the mantle can move upwards into low pressure zones near the surface, where it can melt and form magma when it decompresses. Most people are familiar with the Hawaiian Islands, which are thought to have formed over a hotspot. As the Pacific plate moves northwestward, new parts of the plate are exposed to the stationary plume and a new volcano forms. In this way a chain of volcanoes develops at the same speed as the plate moves and the shape of the chain follows the direction of plate motion. The result is a linear progression in the age of seamounts with distance from the hotspot, with the slope of the line a function of the speed of plate motion. This original theory was accepted for many years, but recently geologists have revisited the idea and found that mantle plumes may not be stationary, and in fact many chains of seamounts may not be formed by such plumes at all. An alternate explanation for intra-plate volcanism is cracking of the lithosphere. Due to tectonic stresses caused by plate motion, brittle oceanic crust may crack in some locations. For example, fracturing may occur due to contraction of the crust as it moves away from mid-ocean ridges and cools down. Magma can rise up through these cracks and form a linear chain of seamounts. These seamount chains will differ from those formed by mantle plumes in that many seamounts in the chain may have formed at the same time and there is thus no linear age progression with distance from the first trace of volcanism. Two key pieces of information that are needed to distinguish between seamounts formed by different processes are the age and the edifice morphology of each seamount. The rocks we collect on this cruise will be used to determine the age of each seamount and our new high resolution multibeam maps will allow us to do quantitative studies of each seamount’s morphology. The young Walvis ridge guyot province consists of more than 60 separate seamounts, and after this cruise we will have maps and eventually ages for about 40 of these seamounts. This information will allow us to determine how many of the seamounts in the Walvis ridge can be attributed to a mantle plume and how many to lithospheric cracking, and whether the mantle plume remained stationary throughout its history.